The RH (Relative Humidity) value given on the Skew-T parameters is the average RH between the surface and 500 millibars (mb). 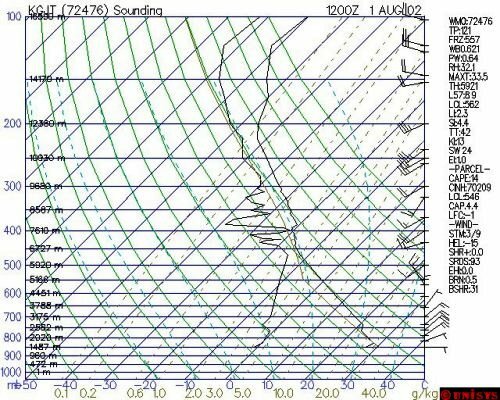 The sounding at the bottom gives an average sfc to 500 mb RH value of 32.1%. This represents fairly dry air. This is also obvious from the large dewpoint depressions in the lower troposphere (i.e. surface temperature = 82 F (28 C), dewpoint = 32 F (0 C). 2. How is RH determined? At any pressure level, when the temperature and dewpoint are known, the RH can be calculated using an involved mathematical formula. The RH is determined at all pressure levels data is available between the surface and 500 mb and then these RH values are averaged. Stability: A low sfc to 500 mb RH value (less than 50%) usually represents a very stable troposphere. Rising parcels of air in a dry environment will have to rise a significant distance to produce saturation. A low value indicates either a very dry and deep air mass is over the region and/or tropospheric sinking dominates-- thus no precipitation or convection is imminent. The exception to this rule is if a thin layer of very moist air in the PBL is under a deep layer of very dry air or in cases where elevated convection / upper tropospheric lifting occurs. Precipitation: A very high sfc to 500 mb RH value (80% or greater) indicates that significant lifting will likely produce precipitation. Saturated conditions along with lifting will produce precipitation. Lifting will gradually saturate the troposphere over time since rising air cools toward the dewpoint. a. Since the RH value is an average it will miss shallow regions with much drier than average or much more moist than average air. Look at the Skew-T to find these slices. Convection can still occur in cases where the sfc to 500 mb RH is very low but the PBL is very moist. b. Elevated convection and/or elevated lifting can occur. Elevated convection is convection in which the parcels first start rising well above the PBL. The lower troposphere can be dry and stable while convection occurs aloft and precipitates into the stable PBL. In these cases, virga and intense evaporational cooling (producing gusty winds at the sfc) are common. Lifting from DPVA or jet streak divergence can produce lifting and precipitation that is elevated. This can also occur when the sfc to 500 mb RH is initially fairly low.